One of Aberdeen’s oldest charities has been giving local people a taste of living without sight, during Remember a Charity Week. North East Sensory Services (NESS), which has offices in Aberdeen, Dundee and Elgin, supports over 6500 people in the north-east who have sight or hearing impairment. 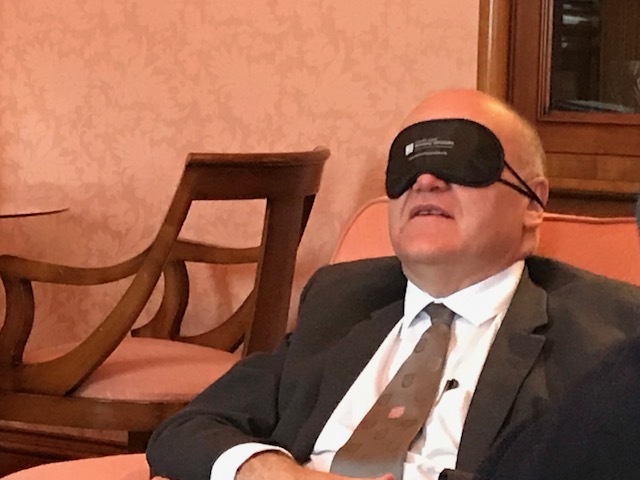 The charity invited local dignitaries to experience what it feels like to live without sight this week, by taking them on a blindfold guided walk. Aberdeen’s Lord Provost, Barney Crockett, was guided along Union Street and around the Town House buildings by NESS volunteer Christa Reid. The Lord Provost wore glasses which demonstrated serious sight impairment and was given instruction by Ms Reid, to negotiate busy streets, steps, narrow doorways, revolving doors and busy corridors. Russell Borthwick, Chairman of the Aberdeen and Grampian Chamber of Commerce, agreed to be blindfolded while he was guided around the AGCC offices in Aberdeen, and Zoey Clark, World Athletics Championships silver medal winner and University of Aberdeen graduate, learned how to navigate Aberdeen Sports Village in a blindfold. “but actually the noise and voices made walking around more difficult! “Remember a Charity Week is an annual event which asks people to think about the charities in there area and consider leaving a legacy to help less advantaged people. L-R, Paul Whitecross, Nick Nairn and Ross Spence. Three of Scotland’s finest chefs are teaming up to share their passion for food in a unique culinary experience, which is set to be a recipe for success for Aberdeen. Nick Nairn, Ross Spence, executive chef at The Marcliffe Hotel & Spa and Paul Whitecross, executive chef at Trump International, will each present an individual course aimed at delighting the senses, showcasing their world-renowned gastronomic skills. 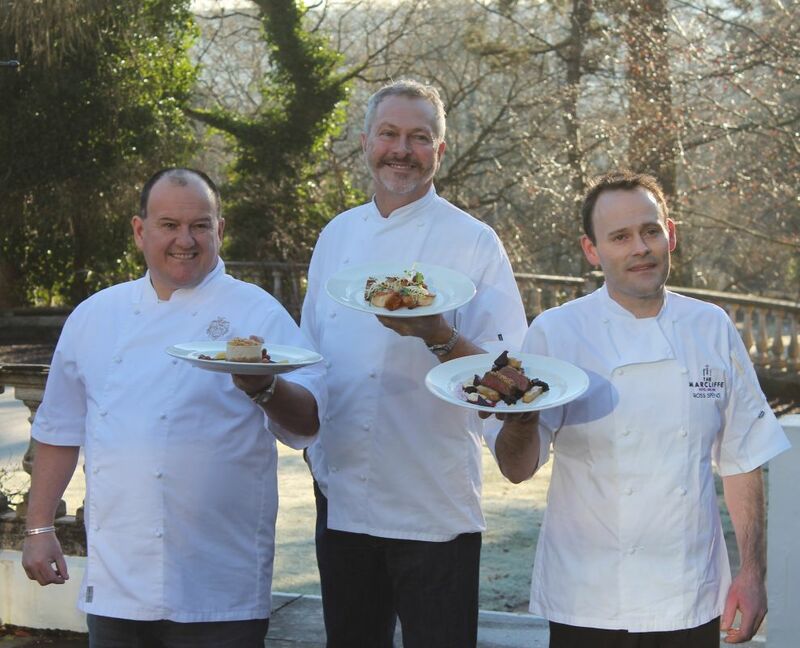 The trio are working together to cook-up Savour, a culinary feast which will take place on Saturday, 4th March, at the Marcliffe Hotel & Spa. The event is being hosted alongside North East Sensory Services (NESS), a charity which supports people of all ages from babies to grandparents, who were born deaf or blind, or for those who have lost their sight or hearing. The chefs will each create a course for the gastronomic adventure, focusing on the senses of taste, smell and sight, which coincides with the charity’s work with people with sensory issues. “We are delighted that these prestigious chefs are taking the time to devise and present a unique menu for NESS. We are looking forward to an incredible evening, which will excite the senses. Savour will take place on Saturday, 4th March, 2017, at the Marcliffe Hotel & Spa. Tables are priced at £950, with individual tickets available at £95, and can be purchased from neil.skene@nesensoryservices.org or by calling 0345 271 2345. Issued by Frasermedia Ltd on behalf of NESS. A 137-year-old north-east charity is looking forward to continued success after celebrating its best year ever in 2016. 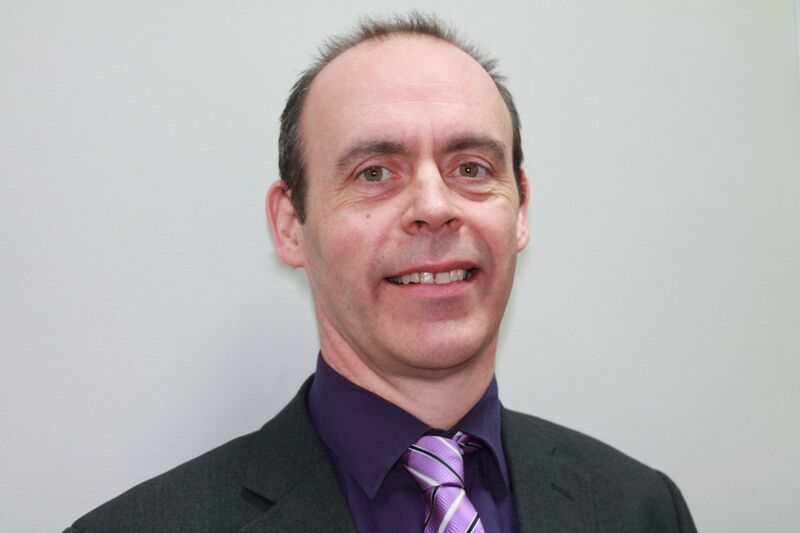 North East Sensory Services (NESS), which has centres in Aberdeen, Dundee and Elgin, won four new contracts in 2016 to offer its services to over a thousand additional blind and deaf people across Scotland, bringing the number of people it supports to over 5,500. In Dundee, NESS has provided support to deaf people since April 2013, and in October the charity won a tender to expand its services to blind people, enabling it to offer a joint sensory service, including rehabilitation and practical advice, under one roof. As a result, those with both hearing and sight loss will be able to access help in one visit. NESS will also offer additional services to Dundee and Angus in 2017, including IT support and employment advice. 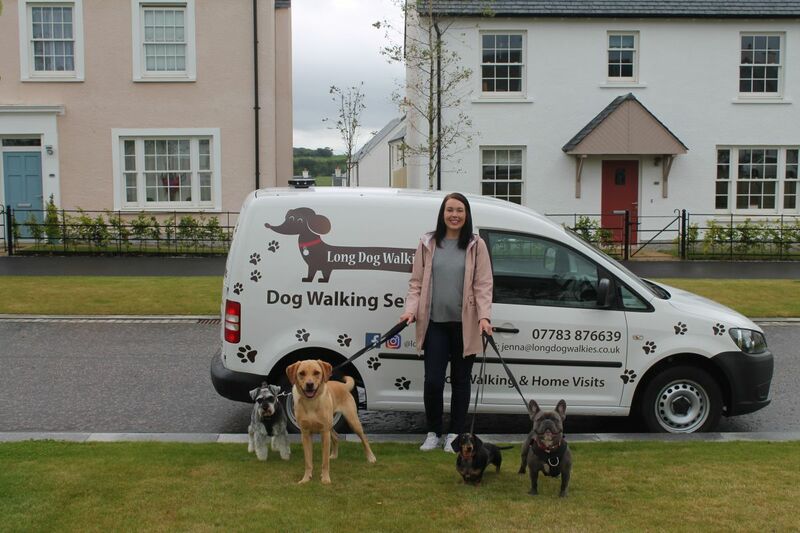 Additionally, NESS successfully tendered to continue its popular service for blind and deaf people in Moray, as well as winning two separate contracts to provide blind and deaf services on behalf of Angus Council. In July, the charity won the Investors in People, ‘Excellence in the Third Sector’ international award after achieving the Investors in People Gold Standard in March, following a comprehensive analysis of the charity’s people management. NESS has also recently launched a revolutionary new website designed for easy use by those who have very poor vision, offering advice on living with sensory loss and detailed information on support services available across the North-east. Furthermore, NESS played an important role in sight loss research by hosting the Aberdeen Retinitis Pigmentosa (RP) Information Day in September, which saw scientists share the latest RP genetic research advances. “Despite challenging times, 2016 was a milestone year for NESS. We are delighted to have won four competitive tenders, which are the result of a great deal of hard work and dedication by every member of staff and volunteer at NESS. “Joint sensory services are a major step forward and NESS has been a pioneer in providing help and advice for blind and deaf people under one roof. Many older people have difficulties with both vision and hearing, so being able to access support for both senses in one place is a major advantage. “Demand for our services is increasing due to an ageing population, so it is important that we continue to develop our services and expand. Aberdeenshire’s newest bike ride has been hailed as a huge success, after hundreds of cyclists and spectators attended the event on Sunday 4 September. A total of 238 participants took part in the Chapelton Bike Ride, which took place in the new town of Chapelton, near Newtonhill. Hundreds of spectators flocked to the town’s Hume Square to watch as cyclists returned from the 12 and 42-mile routes. The bike ride was held in aid of North East Sensory Services (NESS), a sensory impairment charity that supports over 4800 people in the North-east. Over £6000 was raised for NESS through the Chapelton Bike Ride, which will help the charity provide social work and life-enhancing services to people who have sight or hearing loss. Also participating in the event were housebuilders from Chapelton developers ZeroC, A&J Stephen and AJC Homes, as well as David Carnegie, the Duke of Fife, from Elsick Development Company. After a friendly competition against one another, Alistair Gordon, Earl of Aboyne and managing director of AJC Homes, came out on top, as he crossed the finish line with a time of 2 hours 45 minutes across the 42-mile route. “All of us here at NESS are thrilled with the number of cyclists and spectators who attended the Chapelton Bike Ride. A lot of organisation and planning went into the event, as it’s only in its first year, so it’s great to see that all the hard work has paid off. 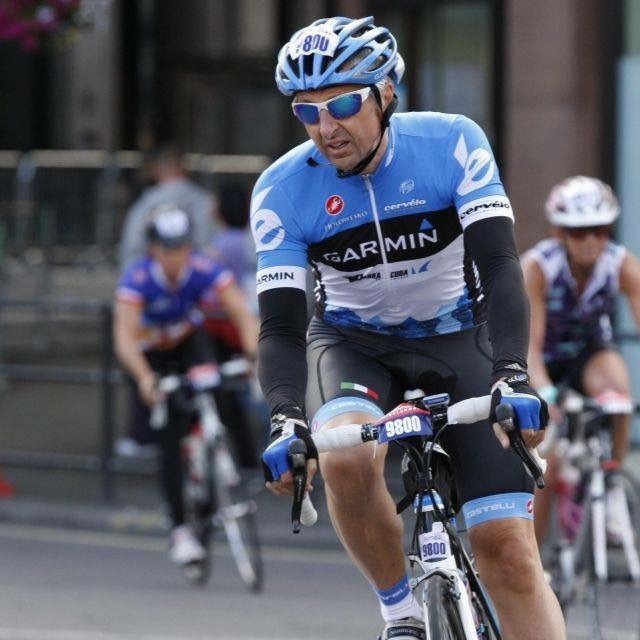 “It was a fantastic day and we received lots of positive feedback from the cyclists, who said that both the 12 and 42-mile routes were great fun to take on. 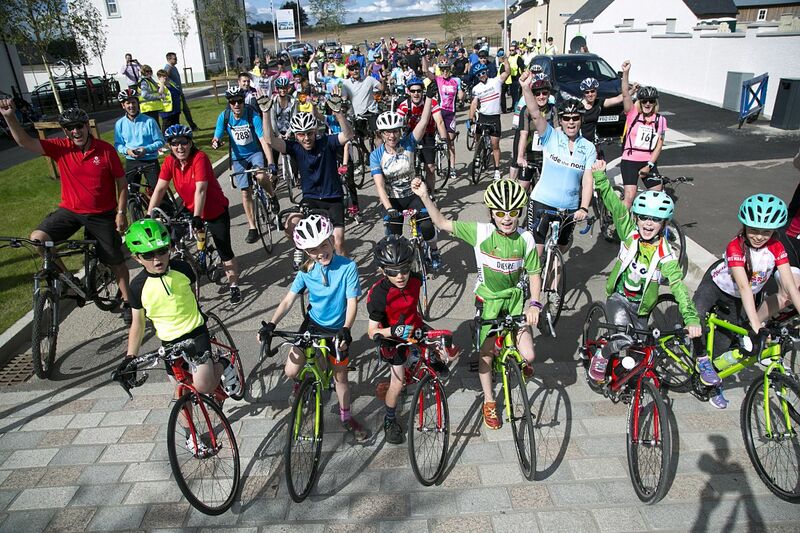 “The atmosphere in Chapelton was buzzing, as the square was packed full of residents and visitors who turned out to enjoy the wonderful local music and food and drink that was on offer – as well as cheering on the cyclists throughout the day. 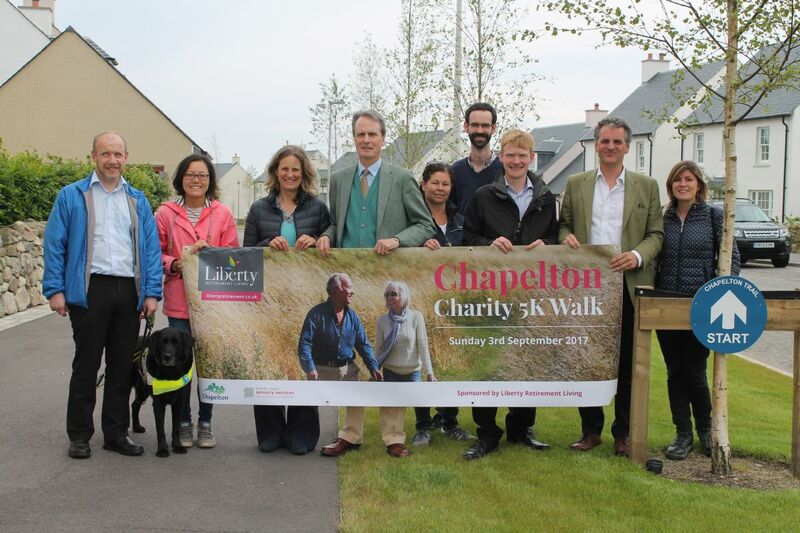 “It was a great feeling welcoming everyone to Chapelton for our first ever major event. The day was a huge success and we’re proud to have worked alongside NESS to help raise funds for such a worthwhile cause. “Chapelton’s sense of community was really evident on Sunday and the spectators did a brilliant job of cheering on the cyclists, which helped to significantly boost their morale. “The live music, entertainment and delicious food available were all extremely well received and everyone who came along had a great day out. “There was lots of healthy competition between the Chapelton housebuilders and they had a good laugh joking about who would finish first, so it was very entertaining watching Alistair from AJC Homes cross the finish line first. 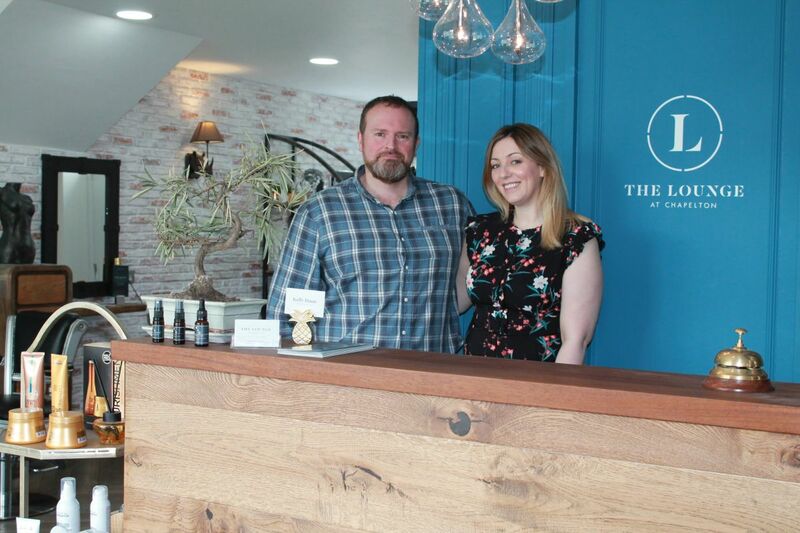 “I’ve also been really impressed by everyone’s fundraising efforts for NESS and fully embracing this charity initiative within the community where they work. Formerly Grampian Society for the Blind (GSB), North East Sensory Services (NESS) works with over 4,500 people with a sensory impairment in Aberdeen, Aberdeenshire, Moray, Dundee, Angus and Perth & Kinross.